In this letter to Colonel Henry Inman, James W. Baird writes in regard to Inman's recent book "The Old Santa Fe Trail: The Story of a Great Highway." Baird informs Inman that his grandfather, also named James Baird, organized the first trading expedition to Mexico using the Santa Fe Trail along the way. Included are dates and details of Baird's grandfather's travels. 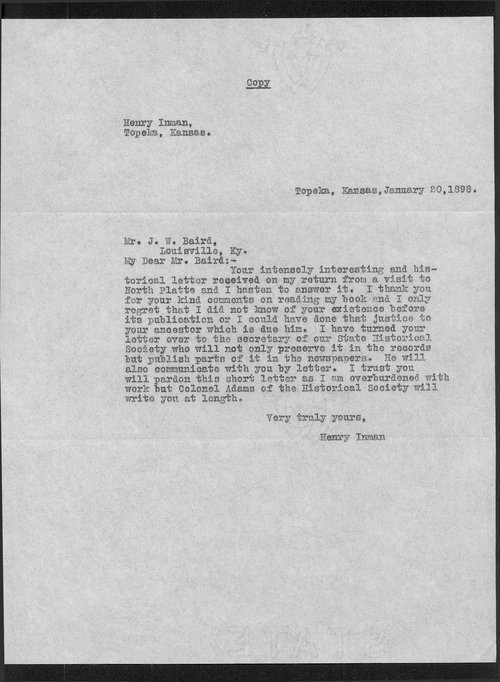 Also included is Inman's response to Baird in which Inman states that he will put Baird in touch with William E. Connelley, Secretary of the Kansas State Historical Society.